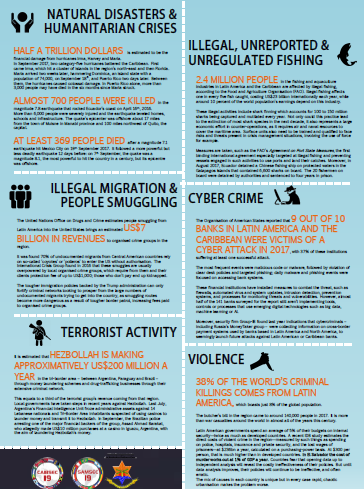 While narcotics have long dominated the security dialogue in Latin America and the Caribbean, new issues are increasingly gaining attention, such as terrorism, illegal fishing and cyber crime. The crisis in Venezuela is escalating and emigration is expected to reach five million, renewing focus on inter-state tension, while recent natural disasters are highlighting the need for humanitarian assistance. This infographic provides statistics on each of these issues that will be addressed at this year’s CABSEC SAMSEC conference by defence and security decision-makers, to advance cooperation in the region to counter these mutual threats.